The Viagrow ® Galvanized steel raised bed garden is stylish, durable and easy to assemble. This eye catching raised bed is approximately 9 lbs and will hold eleven cubic feet of soil or growing media and measures 47in x 35in x 11.8in. Unlike most wood raised beds the Viagrow ® galvanized raised bed will not rust or rot assuring years of reliable use. 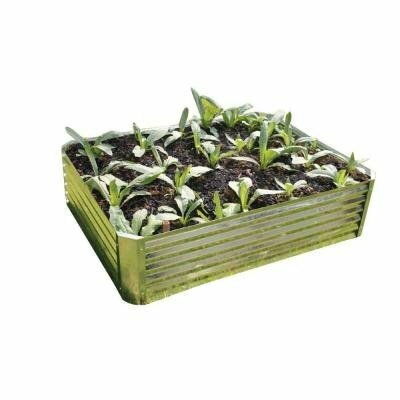 The galvanized raised bed includes four corner joints, four pieces of galvanized edging and assembly hardware.The Viagrow raised bed is perfect for all herbs, vegetables and decorative plants. If you would like a different sized galvanized raised bed please see product code V02103. Less weeding, low maintenance and high yield. Great for flowers, vegetables, herbs and decorative plants. 11.8 inch depth provides room for developed root structure and great drainage.